Virginia State Police has recovered the vehicle belonging to missing Nelson County man, Kevin W. Quick, 45. In addition, the local business community has dedicated $7,000, including a $5,000 cash donation from New Age Auto on East Main Street, as a potential reward for anyone with information that leads to Quick’s discovery. The search continues at this time for Quick, who is a captain with the Waynesboro Police Department’s Police Reserve Unit. State police has received numerous tips and leads regarding the investigation and are actively pursuing them at this time. Investigators are still asking for the public’s help and encouraging anyone with information to call the Virginia State Police at #77 on a cell phone or at (434) 352-7128, or any one of the assisting agencies. Quick’s abandoned silver 1999 Toyota 4Runner was recovered by the Louisa County Sheriff’s Deputy Monday (Feb. 3, 2014). It is now being examined as evidence in Quick’s disappearance. Quick was last seen Friday (Jan. 31, 2014) at 10:15 p.m., when he left his mother’s residence in Afton, Va. He was headed to a friend’s home at Turtle Creek Apartments in Albemarle County, Va., approximately 20 miles away. Quick never arrived at his friend’s residence. During the course of the investigation, photographs have been obtained featuring two unidentified adult males who investigators believe may have information regarding Quick’s disappearance. Quick’s silver 1999 Toyota Forerunner also appears in the photographs that place the vehicle in Fork Union, Va., on Friday, Jan. 31, 2014, and in the Manassas area Saturday, Feb. 1, 2014. Quick was born in Waynesboro in 1968 to Vonda and the late Ronnie Quick. He is the eldest of three brothers. 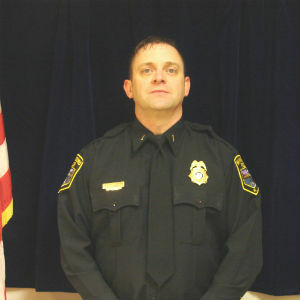 He joined the Waynesboro Police Auxiliary Unit in 1990 and rose through the ranks to his present rank of captain. His father, Colonel Ron Quick, was a member of the Police Auxiliary Unit from 1983 until his death last year. Local and state resources spent Saturday night and Sunday morning searching on the ground and in the air in the areas of the residences in Afton and Albemarle County. Several local businesses have stepped forward and are now offering a collective reward of up to $7,000 for information that leads to the discovery of Quick. The Virginia State Police are leading the investigation into Quick’s disappearance. The Nelson County Sheriff’s Office, Albemarle County Police Department, Charlottesville Police Department and the Waynesboro Police Department are assisting.